Faraway Press: The Online Home of John Jackson Miller: Jarael, Rohlan action figures now shipping! Jarael, Rohlan action figures now shipping! At last! The Jarael and Rohlan Limited Edition Action Figure Comic Pack, announced this summer, is now in stock at Entertainment Earth. 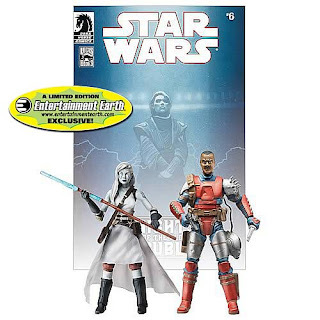 Jarael and Rohlan action figures are in the pack, as well as a limited edition reprint of my Star Wars: Knights of the Old Republic #6 comic book. Each action figure is in the traditional Star Wars 3 3/4-inch scale. There's a price break if you order the whole set — $69.99 for the four. According to Entertainment Earth, customers need to order by Dec. 15 to be sure to get the figures by Christmas. 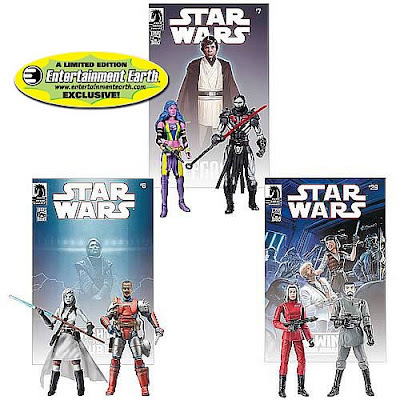 This exciting exclusive action figure set includes Jedi, Mandalorians, Imperials, and more from the Star Wars saga! Each figure is armed with accessories and tons of articulation. Based on the comic book series, these heroes and villains' lives are chronicled but in the special included comic book! Red alert! Knight Errant #3 hits the stands!